Awe Filled Wonder: "Purposeful Play"
There was a time where children played all through summer. They came home from school and they played. They played in their 1/2 day kindergarten classes (if they even went to kindergarten). They played, and they played, and they played. And guess what? They managed to get a man on the moon. They managed to build cars, and factories, and machines. They managed to harness electricity, and they managed to invent indoor plumbing. And they didn't have adults asking them what they were doing. They didn't have adults directing their every move. They were able to play pickup baseball, basketball, football, hockey games. And they were able to solve problems on their own. Interesting, I know! There's a term that gets thrown about in education circles, and it sounds so rational, so reasonable, so "important", but it really bothers me. It's the term, "purposeful play". I understand where the sentiment is coming from, though I don't agree. In theory, when you read articles about "purposeful play" it sounds great. Children are in charge of their own learning (YES! ), children have large blocks of time devoted to play (YES!). But then, when you read further, there is still the adult standing in the corner asking the questions, "What do you think will happen next?" "Why did you chose to build it that way?" All of these questions getting in the way of individual discovery. Though the questions aren't bad, and it is good to reflect on our learning at all ages, it's more of the push to get adults involved in the children's play instead of allowing the children their own time and space in which to play. If the children want the adult to become involved in their play, it should be up to the child to invite the adult. Too often what happens in children's play is the adult gets involved and pushes their own agenda (asking the questions instead of allowing the discovery). Too often uninformed people become involved in the classroom and push their own agenda on the children (reading by Instructional C by the end of Kindergarten- oh wait, lets push them up to a level D instead; writing at a certain level; understanding math facts). Please don't misunderstand. I don't think children should have free reign to do whatever they want, whenever they want. Not at all. But what I do think is that children will learn what they need to learn when they are ready to learn it. 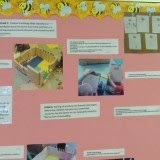 It is my job to create the atmosphere and environment to facilitate that learning. There is still much room for direct instruction from the teacher. 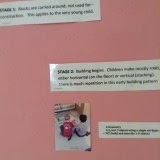 There is still a time for children in kindergarten to do specific work on reading, writing, and mathematics. 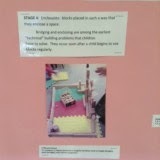 But there is also time for children to do other learning- and that is through their play. If someone were to come into my classroom at choice time, and if you'd asked them what the children are doing, they might say they are playing. They might think what they're doing is "cute" (another pet peeve of mine) . But I would imagine the first thing they might not think is that the children were "learning". It isn't "purposeful play" you know, they aren't doing a fun activity directed by the teacher. In education, and in early childhood development, we know that young children (like all animals) learn best through play. What is unfortunate though, is that people who don't understand early childhood development, who don't understand play (and many of those are in positions of authority over education--- umm politicians and business leaders...) feel the need to impose their opinions and ideas on our children. They think we are "falling behind the rest of the world" and we need to get these kids "learning" at a younger age. So those of us in education, because we have to defend our practices, begin to doubt our own knowledge. We try to synthesize what we know with the expectations of those outside our field. And we call it "purposeful play". But it really isn't play. It's still an adult, forcing their own agenda, while trying to make it "fun". 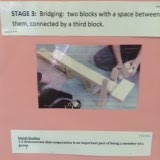 What I put up here are pictures of my students building and creating in the block area, pictures of them drawing what they've built. 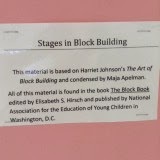 Then I put up quotes from "The Block Book" put out by the NAEYC (it's a classic), as well as which Kindergarten curricular outcomes are met through block play (hint: each of our curricular areas have at least one outcome met, and over 29 individual outcomes are met). All without me getting involved in their learning. 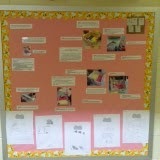 I provide the materials, I encourage cooperation, I might suggests they draw their buildings and maybe write about them. That's as far as I get. It's my job, as their kindergarten teacher, to defend their learning. It is my job to champion Developmentally Appropriate Practice. It is my job to inform those who may not know that ALL PLAY IS PURPOSEFUL. It all meets the needs of the individual wherever that individual is. Silly people, what makes you think children aren't learning? ...And guess what! They managed to get a man on the moon. I love it! Great piece of writing and thanks for thinking out loud. You helped me put words to what I see some days that really irritates me. (directed (purposeful) play). Thank you! It's something I think about frequently. That, and how in the world could we ever have put a man on the moon? Seriously, the people who did that didn't even have AP classes...or the SAT/ACT... or any standardized testing! They probably didn't even learn to read until they were 7! Horrors! What was wrong with them (snark).